Meg bought Ollie this ball a couple of weeks ago. It’s got all the planets of the solar system on it, plus the Sun. But no Pluto. That’s right, it’s barely been two years since Pluto was demoted to dwarf planet status and the toy manufacturers have already made the adjustment. It saddens me that Ollie has to grow up in a world where Pluto isn’t considered a planet, although I take comfort that his textbooks probably won’t be updated by the time he’s in school. 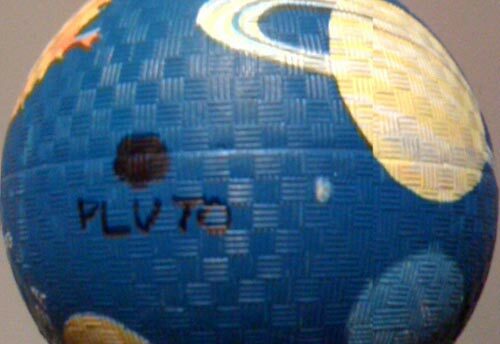 In the meantime, I’ve Sharpied Pluto onto his ball. One ball at a time people, that’s how we win. Good for you for putting Pluto back in where it belongs. There actually are still plenty of solar system related toys being manufactured that include Pluto. You just have to check a toy before buying it, as I’ve seen some with Pluto and some without it. Don’t assume Ollie will grow up in a world where Pluto isn’t considered a planet. The demotion of Pluto, which was done by only four percent of the International Astronomical Union (IAU) was highly controversial and was immediately contested in a petition of 300 professional astronomers led by Dr. Alan Stern, Principal Investigator of NASA’s New Horizons mission to Pluto. The IAU’s new planet definition doesn’t even make sense, as it states that dwarf planets are not planets at all. This summer, I attended a national conference on this issue titled “The Great Planet Debate,” led by prominent planetary scientists. It’s clear this controversy is far from over. When New Horizons gets to Pluto in 2015, its findings will very likely confirm the object is indeed a planet.